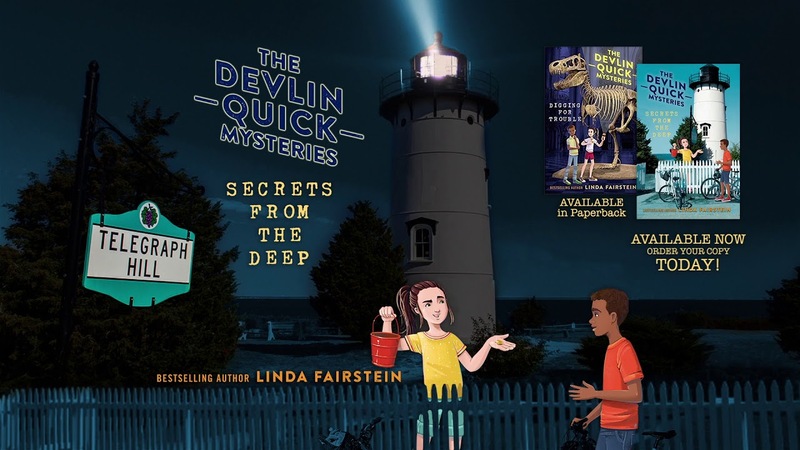 In the third Devlin Quick adventure from internationally bestselling author Linda Fairstein, Dev goes to Martha’s Vineyard for rest, relaxation…and a hidden pirate treasure! After successfully apprehending a map thief at the beginning of summer, Dev is going to spend the second half of her summer vacation in Montana with her best friend, Katie, exploring the outdoors and NOT getting into trouble. But after participating in a dinosaur dig, Katie and Dev suspect that someone bad is in the Badlands when Katie’s found fossils are switched out for old rocks. The good news? With Mom back in New York, no one can stop Devlin from investigating! But the fossil thief isn’t the only danger here, as snakes, scorpions, and bears abound, making Montana a treacherous place for finding answers. And when the mystery takes Dev and Katie back to Manhattan—to the Museum of Natural History—the case gets even more complicated, even with Dev’s friend Booker there to help. Dev has to use her brains, brawn, and yes, okay, the lessons learned from her police commissioner mother if she wants to dig up the truth once and for all. This is the perfect read for fans of Nancy Drew and Theodore Boone. Linda Fairstein worked in the Manhattan district attorney’s office for more than two decades. Her Alexandra Cooper novels are international bestsellers and have been translated into more than a dozen languages. She lives in Manhattan and on Martha’s Vineyard. The Devlin Quick Mysteries are her first books for children. Learn more at www.LindaFairstein.com, or follow Linda @LindaFairstein. Don’t miss Devlin Quick’s other adventures . . .
MORE EVENTS TO BE ADDED! Nothing less than one riveting read. Ideal for bibliophiles and mystery fans alike. From New York Times bestselling author LINDA FAIRSTEIN comes a thrilling mystery series–and an unstoppable heroine! NANCY DREW for a new generation! With all of the heart-pounding excitement that made her internationally bestselling Alexandra Cooper series a hit, Linda Fairstein paves the way for another unstoppable heroine... even if she is only twelve. Tell us what your favorite middle-grade book is...and why! ©Devlin Quick 2019 All Rights Reserved. Want to be notified when we have news for you? Enter your email address and name below to be the first to know..